Sometimes, all of the elements can be there for a roaring blaze but all you get is a little spark and some smoke. Although I went into writer/director Ti West’s newest film, The Sacrament (2013), with high hopes and a head full of overwhelmingly positive critical reviews, I’m rather disappointed to admit that this appears to be yet another underwhelming showing from the modern-day horror auteur. Although I really enjoyed West’s sophomore effort, The House of the Devil (2009), I must admit that I’ve been hard-pressed to really like the rest of his output: The Roost (2005) felt half-baked and slight, The Innkeepers (2011) squandered some nicely built atmosphere with a lazy, perfunctory climax and his entry for The ABCs of Death (2012) managed to be equal parts lazy, stupid and sloppy. My main issue with West remains the same: his films tend to look good but are as empty and slight as cereal commercials. While I’d love to say that West’s take on the infamous Jonestown Massacre is a grand slam, the film is actually closer to an entire nine innings composed of walks and bunts. For a time, The Sacrament manages to hold, build and maintain a reasonable amount of interest and tension. Our trio of protagonists, Sam (AJ Bowen), Patrick (Kentucker Audley) and Jake (indie writer/director Joe Swanberg) are all employed by modern alternative-media outlet VICE, perhaps most familiar to casual fans as the organization that immerses itself in various “outsider” enterprises like street gangs, drug dealers and, apparently, religious cults. This “immersionism,” as the film calls it, results in a neutral, no-judgement take on various societal elements that usually spawn pretty intense reactions one way or the other. Most importantly for the context of the film, VICE is a real organization and their inclusion in the film helps to heighten the realism of the found-footage aspect, as well as blurring the lines between the reality of the situation and the highly fictional nature of filmmaking. This ends up being the film’s biggest hat trick and, for a while, was almost enough to keep this viewer’s attention…almost. The plot is almost simplicity, itself: Patrick’s drug-addled, estranged sister Caroline (Amy Seimetz) has just sent him a letter explaining that she got clean, moved out of the country and hooked up with a religious cult. Patrick plans to head to the tropical commune and check out the situation: when his boss, Sam, convinces Patrick to take him and cameraman Jake along for the ride, we get yahtzee. Once there, the trio notices that there seem to be quite a few more armed soldiers hanging around than seems necessary for a supposedly peaceful commune: the place looks more like a ramshackle army encampment. The followers all seem nice and friendly, however, especially the former gutter-trawling Caroline. Although our friendly heroes are a little wary, nothing seems particularly out of the ordinary…at least nothing that they can put their fingers on. In time, Sam gets his wish and is allowed to interview the cult’s charismatic leader, Charles Anderson Reed (Gene Jones), otherwise known as “the Father.” Reed makes his initial appearance dressed in an all-white suit, wearing sunglasses, entering to rapturous applause: he’s like an older, pudgy, nerdier version of Bono. He also seems a bit cuckoo, although his initial paranoia and dislike of American policies doesn’t necessarily set-off warning bells among the counter-culture journalists. When a young girl (Talia Dobbins) slips Sam a note that says, “Please help us,” however, the group begins to realize that there’s something more sinister going on here. As their departure time approaches, unease and turmoil seems to be spreading through the camp: something’s brewing and it’s making Sam, Jake and Patrick more than a little nervous. When “paradise on earth” suddenly becomes “Hell,” however, the journalists find themselves trapped in a living nightmare and realize the terrible truth: when you immerse yourself too completely in darkness, you tend to disappear. For most of its running time, The Sacrament is a fully competent and well-made film: the cinematography is frequently lovely, the acting is decent and the locations are certainly interesting. The main problem, unfortunately, is the overwhelming sense of “been there, done that.” Perhaps this is due to the fact that Ti West has modeled his film pretty much part and parcel on the real-life Jonestown Massacre: in many ways, Charles Anderson Reed is just a slightly fictionalized version of Jim Jones, right down to the way he dresses. The problem with this becomes a similar problem with any film based on true events: when you know how everything will play out and end, there needs to be other elements to hold viewer interest. Although James Cameron’s Titanic (1997) is a rather dubious example (I’ve never actually sat down to watch the film, so my knowledge of it is strictly anecdotal), there does appear to be one main difference between the two films: Cameron’s film used the sinking of the Titanic as the background for a love story, whereas West seems content to simply rehash the basic beats of the original story. We get very little in-depth analysis on the cult or its members and none of the main characters are ever fleshed-out beyond a few basic brushstrokes: Sam and his wife are expecting their first baby, Patrick is worried about his ex-junkie sister, yadda yadda yadda. With no particularly interesting characters to focus on, our primary focus becomes the story, itself. The problem with this, of course, is that most of us already know how this particular story ends. I could certainly see how someone who’s unfamiliar with the original Jonestown Massacre might be shocked and horrified by what’s on display here but the reality was much, much worse: West’s depiction ends up being a pale imitation of real events. This notion of “same old, same old” is compounded by the fact that horror fans have already seen this particular idea done much better previously: Timo Tjahjanto’s entry in V/H/S 2 (2013), Safe Haven, was a similar “journalists go hang out with a doomsday cult” scenario but managed to be endlessly inventive, eye-popping and a ludicrous amount of fun. The Sacrament is too serious and po-faced to be that entertaining, unfortunately, seeming to strain for a relevance that it just doesn’t fully earn. For all of my disappointment in the film, I still can’t deny that West is a talented filmmaker: the film is filled with highly effective, evocative scenes (the “interview” scene between Sam and The Father is especially atmospheric and well-done) and the mass suicide scenes definitely have a raw power to them. There’s something especially dreadful about watching the helpers mix up the poisoned Kool-aid and serve it to the unsuspecting children as their tearful, resigned parents look on. The violence and gore effects are well-done, helping to ramp up the inherent realism of the piece. On the acting side, AJ Bowen does a typically rock-solid job as the pushy editor, while Gene Jones makes a highly effective cult leader: there’s something about his soft, doughy expressions and wheedling voice that are both strangely soothing and unsettling. 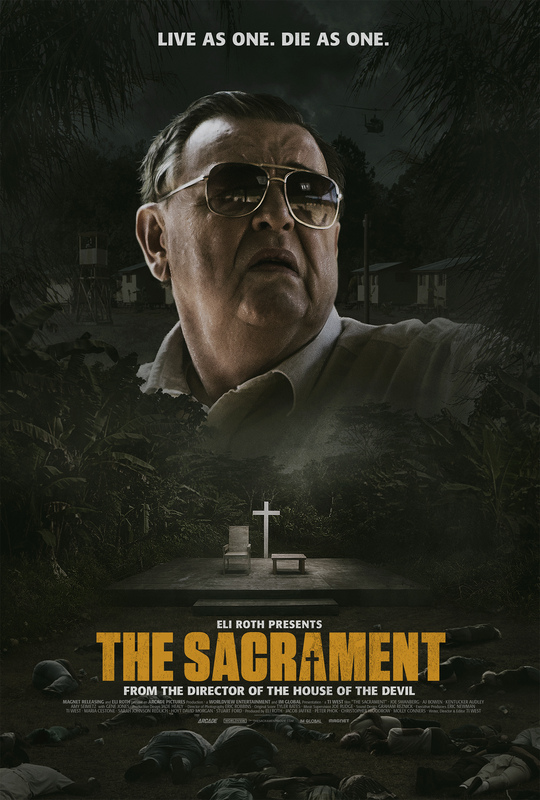 Ultimately, however, The Sacrament is what it is: an extremely faithful retelling of the Jonestown Massacre that features no real surprises and seems to add nothing to discussion of the original incident. While there’s not much technically wrong with the film, there’s also no spark, no real sense of invention or purpose. In a genre that thrives on strong audience reactions to films, whether positive or negative, The Sacrament received the worst possible reaction from me: I shrugged. So middle-of-the-road as to be nearly faceless, Ti West’s newest is another case of “close but no cigar.” I’ll keep watching his films but, at this point, it’s becoming increasingly difficult to muster up much more emotion than faint interest.